Signature : Mumei(unsigned) attributed as Sue Tegai school. This sword Sue Tegai school belongs to joy saku ranking. Blade length : 65.73 cm or 25.87 inches. Width at the hamachi : 3.17cm or 1.24 inches. Shape : The blade is oosuriage mumei(cut shortened) with rather small sori with longer kissaki. Jitetsu : Itame had well grained with jinie attach and masanagare. Hamon : Niedeki suguha with small koashi. Boshi is round shape hakikake style (brush up). 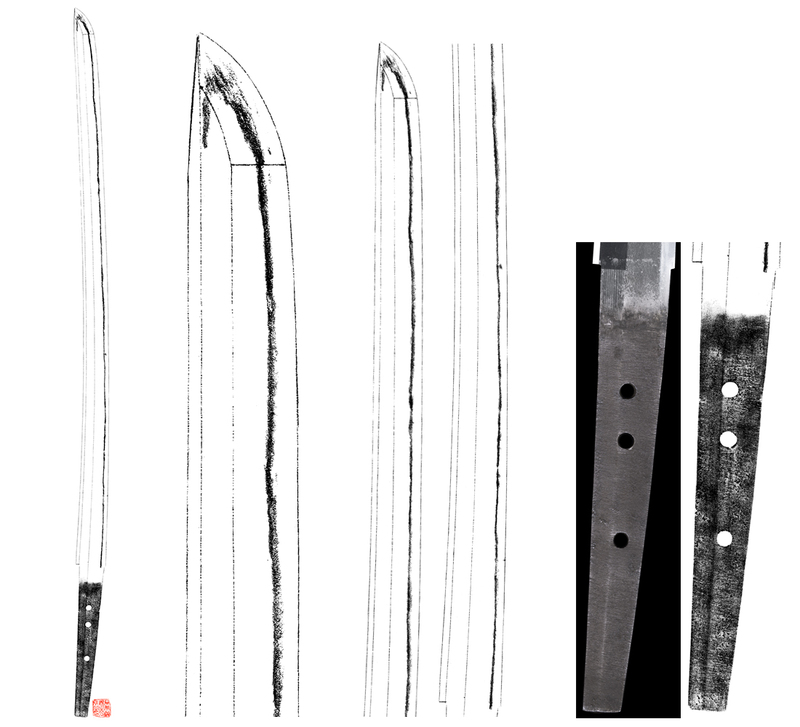 Special feature : At a glance, the blade looks shinto suriage but after check the Jigane and Hamon, and also kissaki hamon, the blade must be Tegai school. I think the blade was made at Late Muromachi period Tegai which is called Sue toga. Tegai school started from Kamakura period to late Edo perios long term. The Shinogoji is item hada with Masanagare and kissaki hamon is hakikake style. So the blade looks sue toga school nice work. 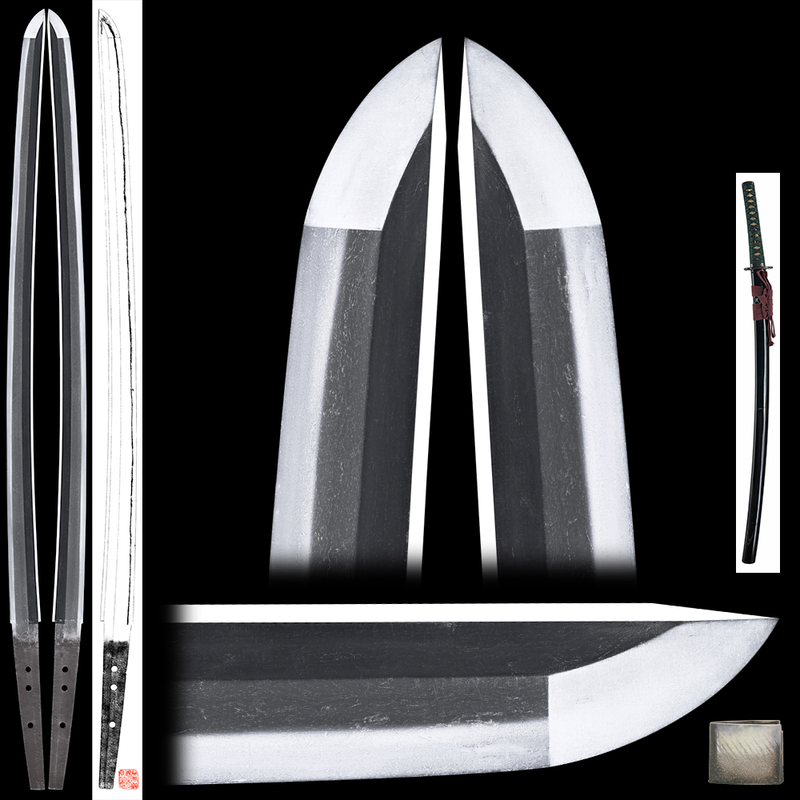 The blade is elegant peaceful atmosphere and never get tired of looking at this sword. Tsuba : On the oval shape iron Tsuba, bird and flowers are engraved with gloss color. Huchikashira : On the syakudo plate, some line are engrave with clouds are painted by gold color. Menuki : Flowers are engraved by syakudo plate with gloss color. If the blade doesn't pass, we will buy back 100% of the sales price.